Snow Hill station (Birmingham Station until 1858) was the prestige station in Birmingham - the epitome of GWR opulence with its grand Great Western Hotel frontage, mosaic floors in the platform tea rooms and a vast subterranean booking hall and goods offices - immaculately covered with white salt-glazed tiles. 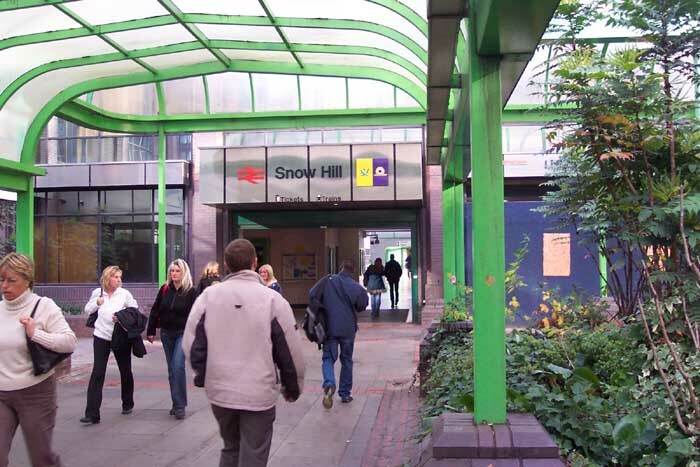 Originally built as a temporary wooden station, Snow Hill was rebuilt in 1871 as a permanent structure and again in 1906 as the grand station depicted in numerous books and fondly remembered (unsurprisingly when compared to even the pre-1960s New Street!). Unfortunately, in 1972 following British Rail's decision to electrify the routes through New Street, Snow Hill became rather superfluous to requirements. 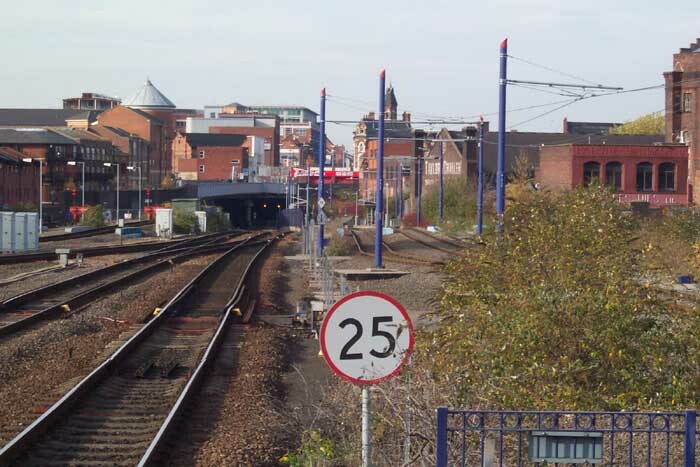 In addition to this, maintenance was becoming prohibitively expensive (which was somewhat accelerated due to the complete neglect the station had faced since the mid to late 1960s) - the station was slowly creeping down Snow Hill, for example! 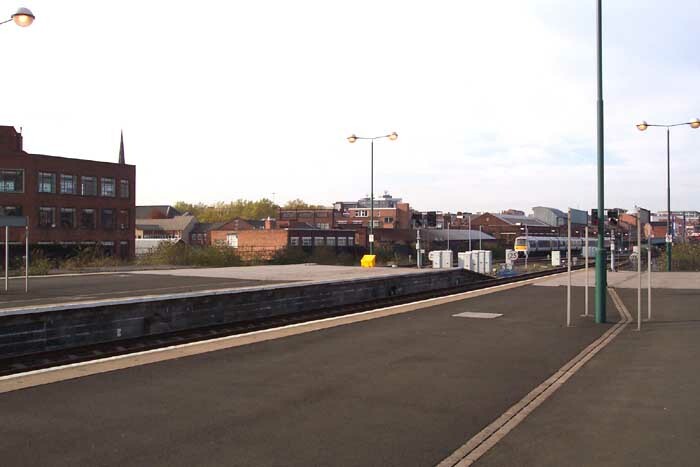 Thus, the station bowed to the inevitable and closed in 1972 along with the line up to and including Wolverhampton Low Level and the tunnel connection through to Moor Street. For those of you wanting a more in-depth study of Snow Hill, I'd recommend Derek Harrison's book shown in the 'Useful Publications' pages: it may be out of print but well-worth obtaining if you get the chance. 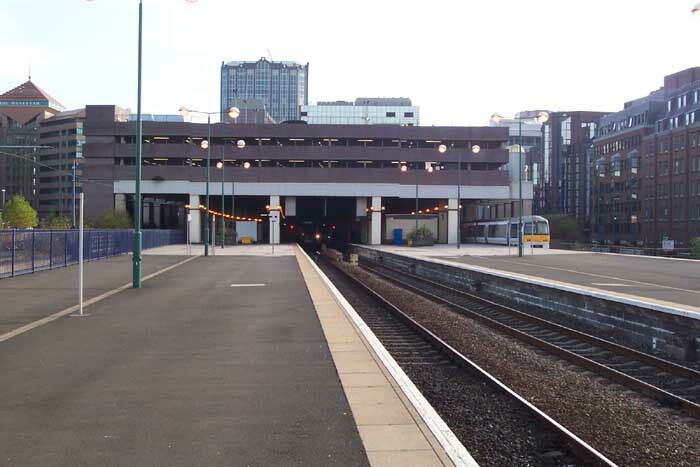 For our purposes, however, the hotel was demolished and trackbed removed and the obligatory NCP car park installed between the platforms - this state persisted until the mid-1980s. As can be seen from the above photograph, the 'new' Snow Hill station hasn't quite recaptured the character of its charismatic namesake - being hidden beneath an office complex. However, the scorched earth policy of many a station's rebirth was more minimal here so I have divided the study into two pages: this page looks at the current station itself, the following page looks at the construction upon which the station and trackbed rests which is original. Above-left we see the canopied entrance walkway which leads to a suspended 'bridge' taking you to the booking hall. 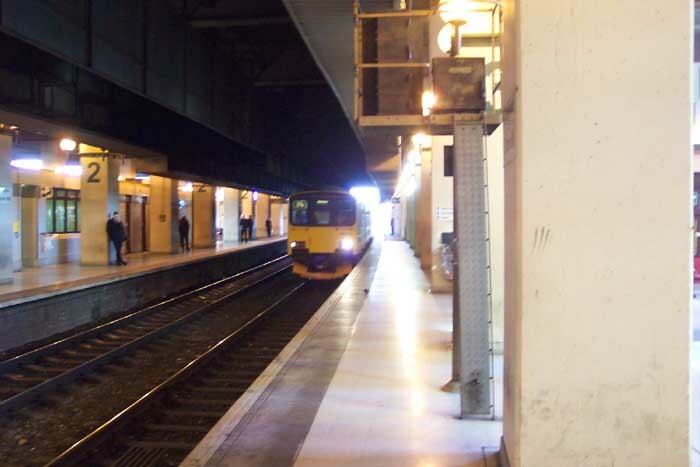 Above-right we are on platform 3 as an unknown DMU enters the tunnel which emerges at Moor Street. 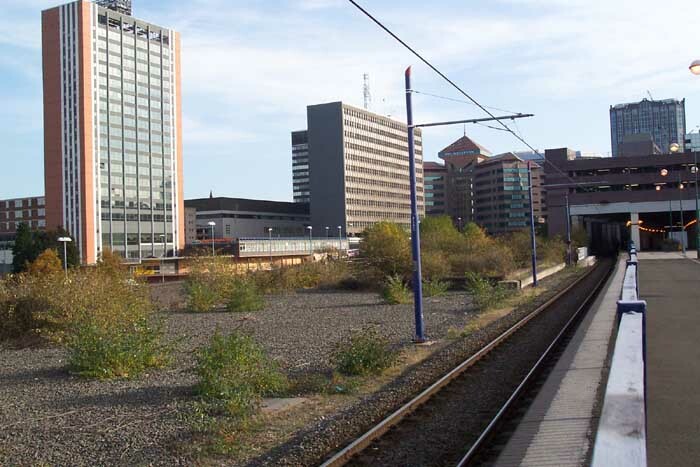 I have to admit to being a little disappointed that planners in the 1980s sought to recreate a New Street architecture at platform level (dark, bleak, inhospitable) in stark contrast to the open overall roofed approach taken by the original architects of Snow Hill. 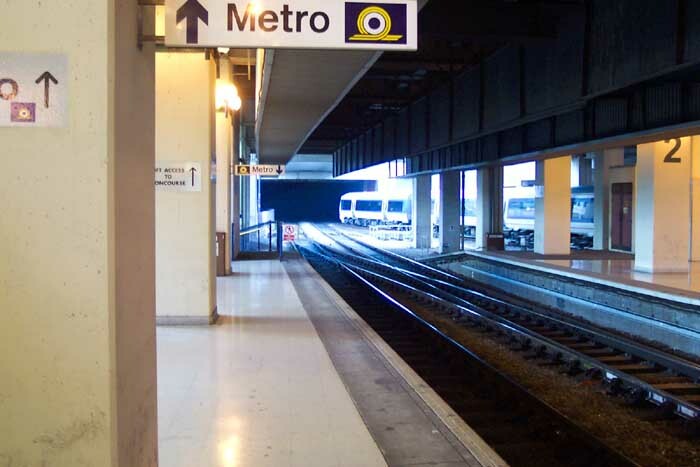 To further illustrate my point, above-left we are again on platform 3 but looking in the opposite direction to the previous photograph. 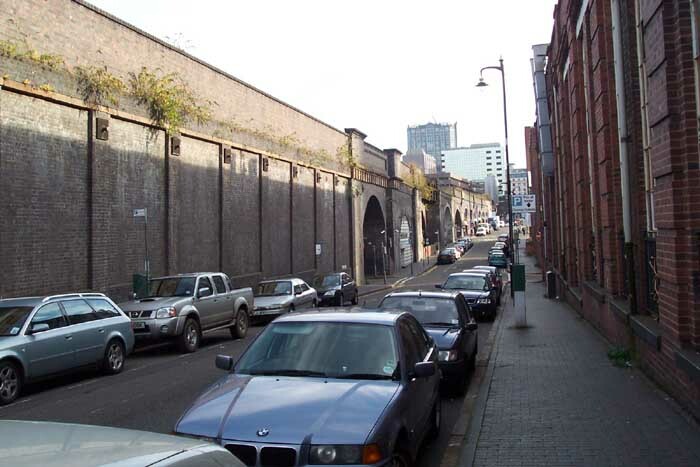 Above-right I decided it was time for some fresh air and walked along platform 3 to look towards what is now St Pauls Metro stop but once would have been goods sidings to the right, a turntable, and the trackbed disappearing under Livery Street on its way to Hockley station. Above-left is another shot of this view but taken from a little nearer to the station. 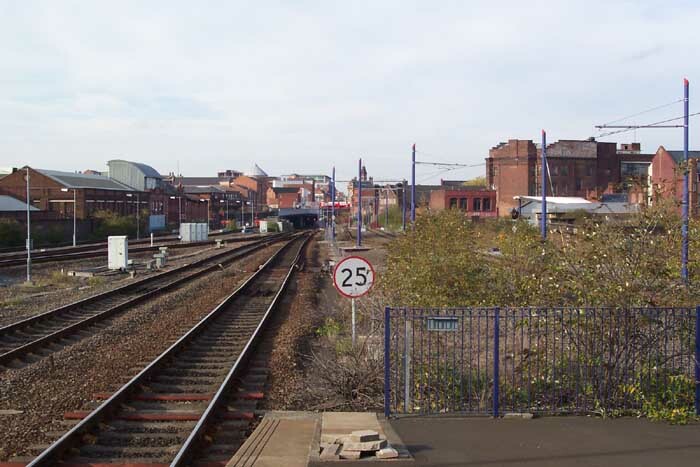 Above-right we are looking back at the station along platform 4 and the single line Metro track can be seen - the terminus of which lies ahead in this view. It is an interesting shot as it shows that the current station is on a smaller scale than its GWR predecessor - look at all the open space to the left of the shot. If my recollections of the old station are correct (I used to explore the site, tunnels and underground structures with a torch and sketchpad during school holidays in the early 1980s! ), the open area ahead and to the left was above the goods offices/loading bay. The final two shots of the station platform level: above-left I am looking across the platforms from the end of platform 3 and above-right I am looking back at the station and unobtrusive car park again from the end of platform 3 with Livery Street to the right and Snow Hill to the left. Above-left we have moved to the corner of Livery Street and Cornwall Street. 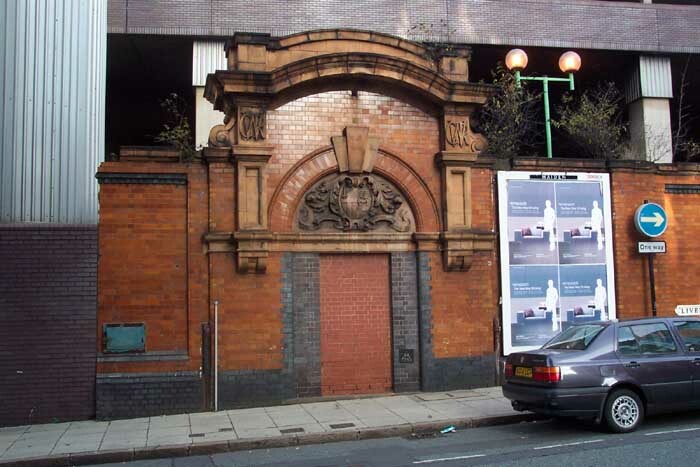 This was a pleasant find - an original GWR doorway which was once part of a wall which bordered the station along Livery Street: notice the GWR logos at the top of the doorway (best viewed in the enlarge photo - click on image). 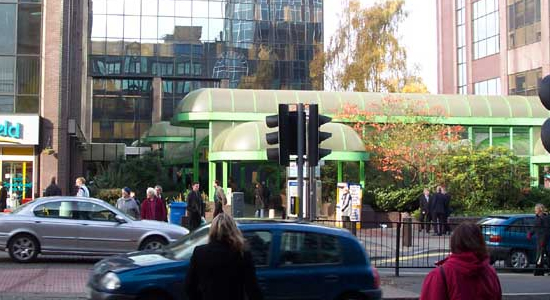 Above-right we have continued down Livery Street - the station entrance, to get the bearing, is in the distance where you can see the office blocks. As I have discussed earlier, the whole station is built on a raised structure and this view provides a good insight into the sheer scale of this enterprise. Above-left we are at the junction of Livery Street and Great Charles Street Queensway. This picture illustrates that the new station does not occupy the same groundspace as the old one. 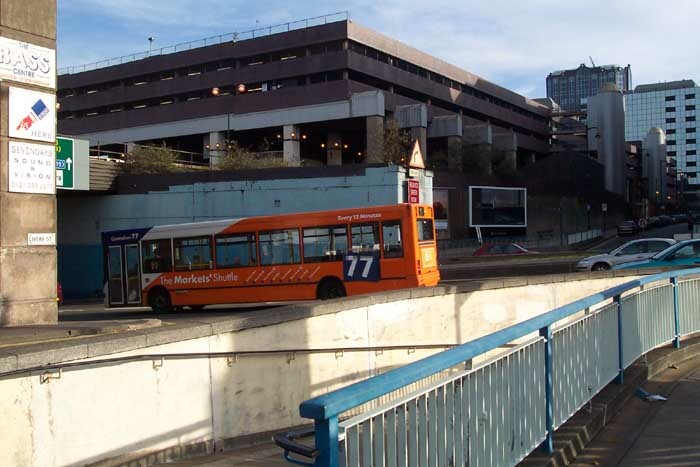 The multi-storey car park above the station can clearly be seen and just above the bus you can see that part of the support that once carried the trackbed has lost its bridgework signifying the narrowing of the station site. 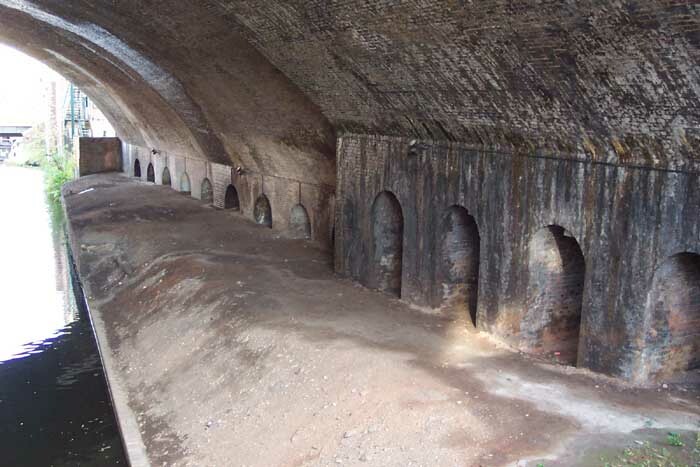 Above-right I have included a shot of the arch base that spans the Birmingham & Fazeley Canal. To appreciate the sheer scale and work that must have gone into building this structure I recommend a visit and a walk around the station's perimeter. 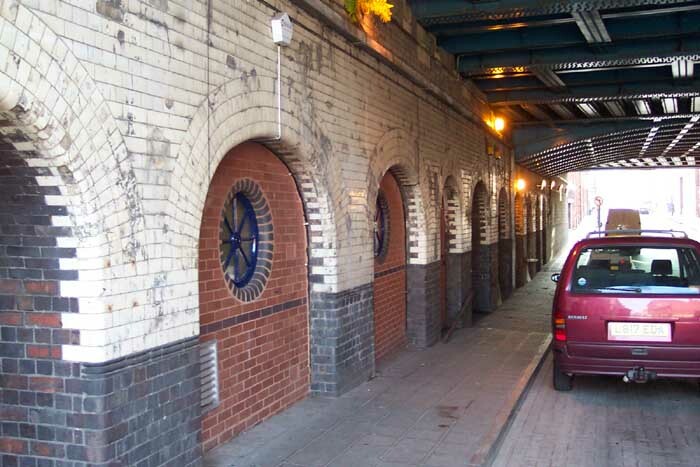 Above-left we are in Henrietta Street and can see an example of the salt glazed tiling which adorned parts of the station (goods yard, for example). These are private 'factory units' but clearly were constructed by the GWR. 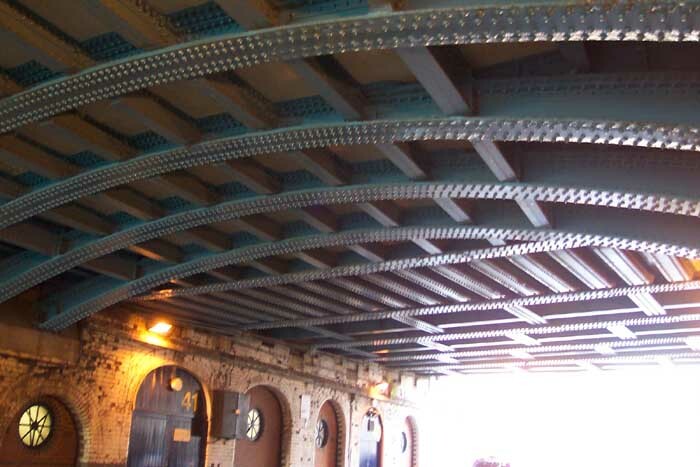 Above-right shows the intricate riveting of the ironwork arch over Henrietta Street - this is paricularly interesting as for the most part, all arch supports were blue-brick: here we see green painted ironwork. If you get the chance, visit the site (don't necessarily enter the station as this is not especially interesting as my earlier shots should have demonstrated) but walk around the outside. You will find all manner of GWR relics - even a now closed GWR green iron public toilet!